The Columbia toilet supports enhance both independence and dignity. Our supports free caregivers from holding a child during toileting. With a full choice of sizes, all models fit any institutional, school or home toilet. Built for support, all have orthopedic contoured backs with support belts. Easily mounts with same bolts that hold toilet seat bowl. Back lifts off base, freeing the toilet for regular use. Does this seat have a back seat belt, and side handles. This item does not have all three safety features you're looking for. 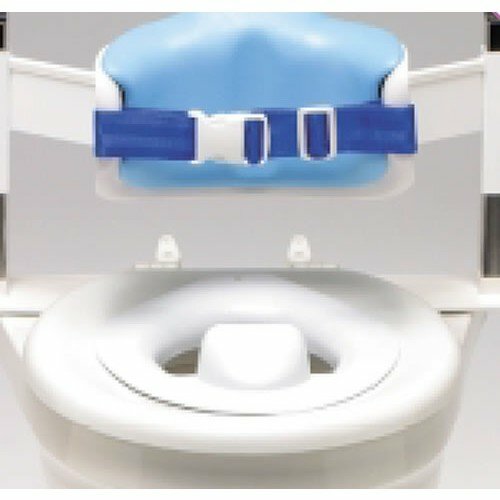 A better option could be the Columbia Medical SecureSeat Hi Back Toilet Support, which has all the restraints but no handles.